Happy eve of Thanksgiving! Today I wanted to share a light, healthy recipe that is also incredibly easy to throw together. 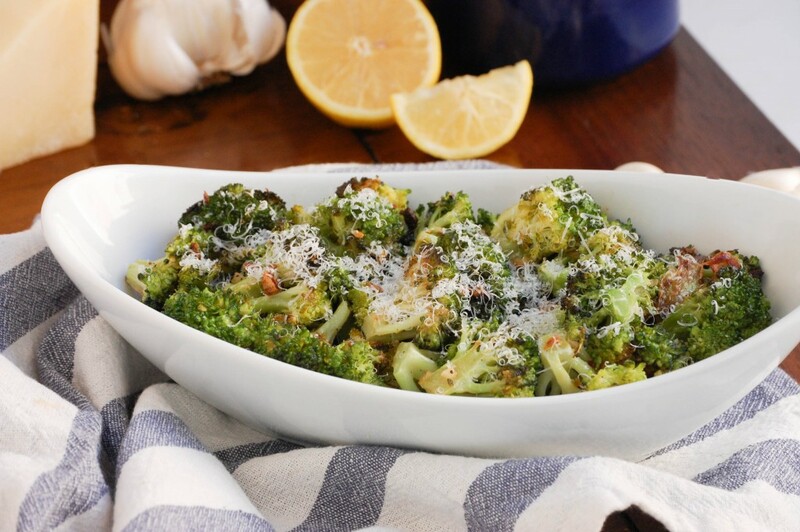 This Garlic Roasted Broccoli goes well with any main dish and can be made any time, even as a last-minute side for Thanksgiving. I don’t mean to brag, but…I will. 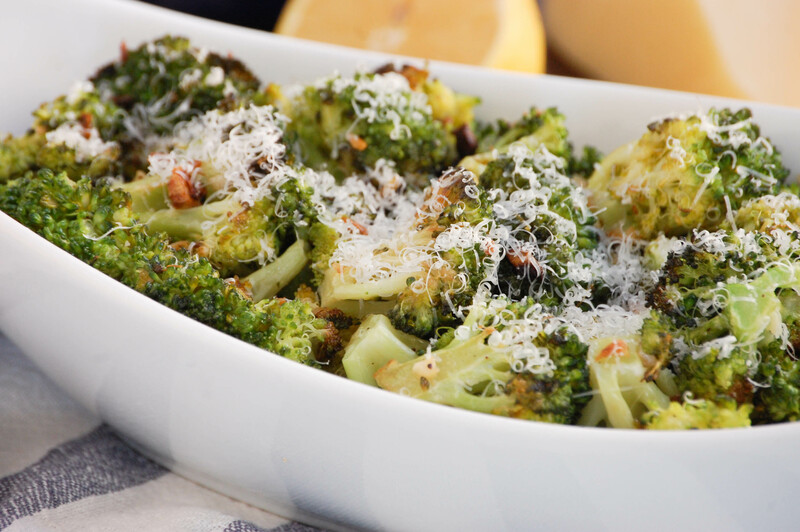 Even my 2 year-old nephew loves his broccoli thanks to this recipe. I’ve made it for my own parents, for my in-laws, for a group of 12 girls at a bachelorette weekend; it has been a hit with every crowd. You may be able to tell, it’s my go-to side dish. The main secret to this recipe’s success: garlic. It makes a big difference in flavor if you use fresh garlic versus the pre-chopped stuff. This is one of the few recipes where I actually peel and chop fresh garlic. Otherwise I am usually guilty of using the minced garlic you can buy at the store since it cuts down on time, and because I have some strange aversion to how sticky garlic peels are. But use fresh garlic for this one, you won’t regret it. From start to finish the recipe takes less than 20 minutes. It’s one of those dishes that after making a few times you don’t need to read the recipe anymore, since it’s so simple. Before tossing the broccoli with olive oil make sure that it is dry. That way it’ll get crispy in the oven, versus steaming. 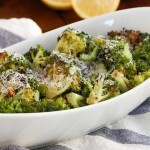 Once the broccoli is fork-tender, finish the dish with a drizzle of lemon juice and a bit of parmesan. As a disclaimer I’ve shared this recipe before, you can view the original one on PaleoGrubs if you like. It’s too good not to share with you here as well. The District Table will be offline the rest of the weekend since I will be in Canada celebrating Thanksgiving! (Ironic, I know.) Have a great holiday and see you on Monday! Preheat the oven to 400°F. 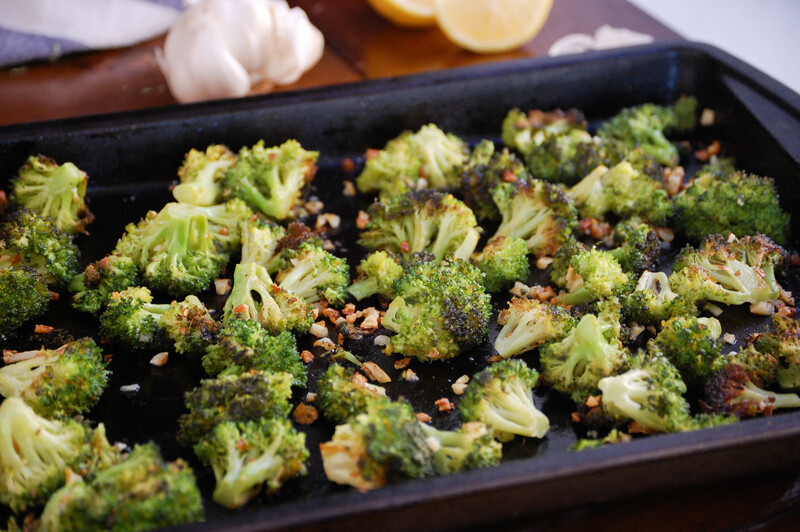 Cut the broccoli into florets and spread out on a rimmed baking sheet in a single layer. Sprinkle the chopped garlic over the broccoli. Drizzle with olive oil and toss to coat. Sprinkle with salt and pepper. Place the baking sheet in the oven and roast for 15-20 minutes, turning once. Remove when the broccoli florets are fork-tender. Place in a serving dish and drizzle with lemon juice. 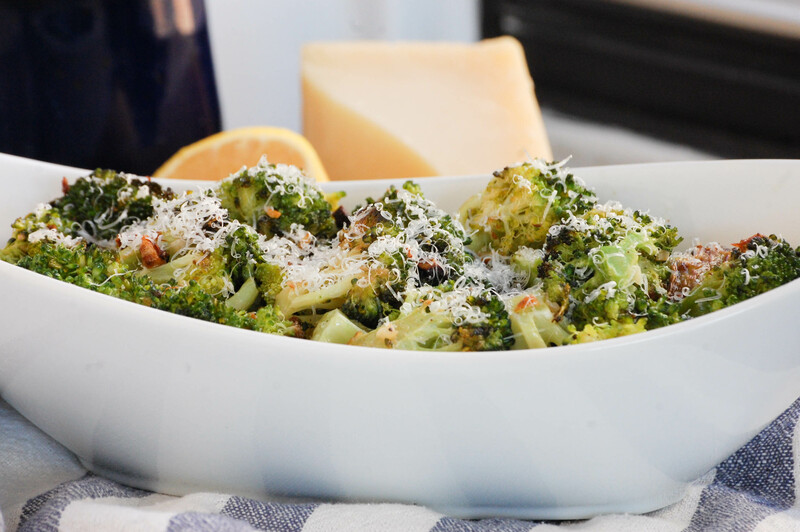 Top with grated parmesan to serve.